LATEST Update dated 11.04.2019 : Good news !! Joining Process/ District Allottment Process under UP 69000 Assistant Teacher Bharti will start in June, 2019 after result declaration. Joining Process of 69000 Teacher Bharti may complete in July, 2019. Read full news from image below…. 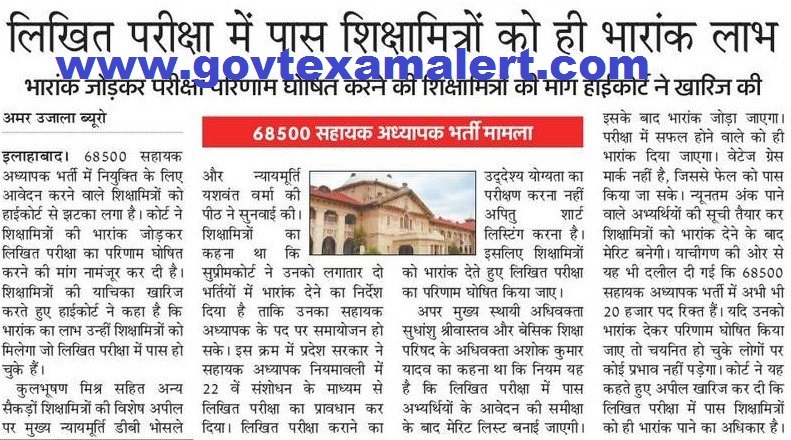 Lucknow Bench of Allahabad High Court has given Important decision regarding UP 69000 Teacher Bharti Cut Off Today. 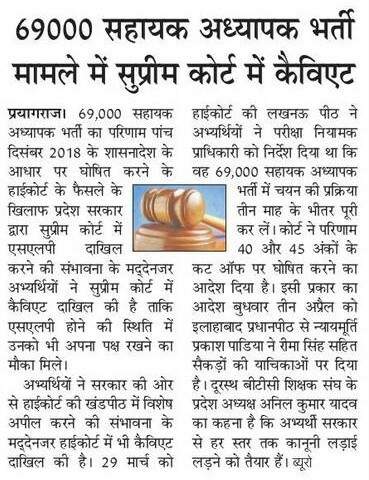 High Court has cancelled Govt Decision of Cut Off and Ordered to Announce Result in 3 Months with 68500 Teacher Bharti Old Cut Off. There are less chances for result declaration after that due to General Elections. UP Teacher Result may announce in June, 2019. Read full news from links below..
LATEST UPDATE 69000 Teacher Bharti Court Case News 23.02.2019 : Good News !! Any Decision on UP 69000 Assistant Teacher Bharti Result 2019 will be taken soon. Hearing in Lucknow Bench is completed Now & Decision is kept safe by Bench. Read full news from Image below..
UP 68500 Teacher Bharti is still under doldrums. Unsuccessful Candidates of Re Evaluation Result has decided to filed a Writ on this Result. While on the other hand, Candidates are demanding to add left out vacancies for 68500 Teacher Bharti to 69000 Teacher Bharti. Read full news from image below…. UP 68500 Teacher Bharti Re Evaluation Result has announced Now. Out of 30852 Applications, Additional 4688 Candidates has qualified exam thus Total 46244 Candidates qualified in Exam. UP Exam Regulatory Authority has uploaded Marks of Teacher Exam. UP Assistant Teacher Re Evaluation Result will be available till 28 February, 2019. Check Result from link given below……. 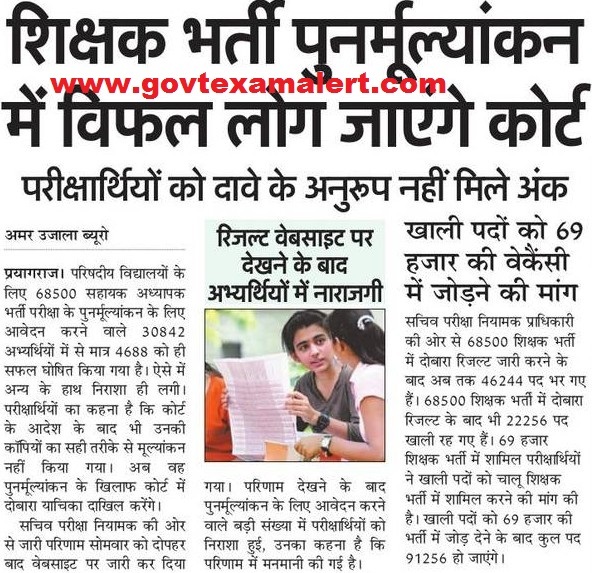 UP 69000 Teacher Bharti Exam Final Answer Key is not released yet. Any Decision regarding Final Revised Answer Key will be taken by High Court’s decision on 31 January, 2019. Now Final answer Keys may release along with the result. read full news from link below..
95.13% Candidates appeared in 69000 Teacher Bharti Eligibility Exam 2019. Out of 4.31 Lac Candidates 4.10 Lac Candidates appeared in exam. 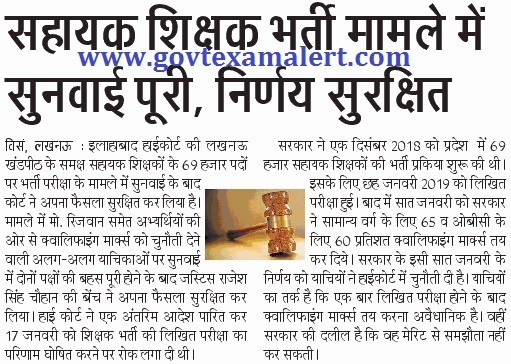 Answer Keys will release on 08 January, 2019. read full news below…..
Allahabad High Court has deny demand of Shiksha Mitra’s to announce 68500 Teacher Bharti Result with adding weightage Marks. 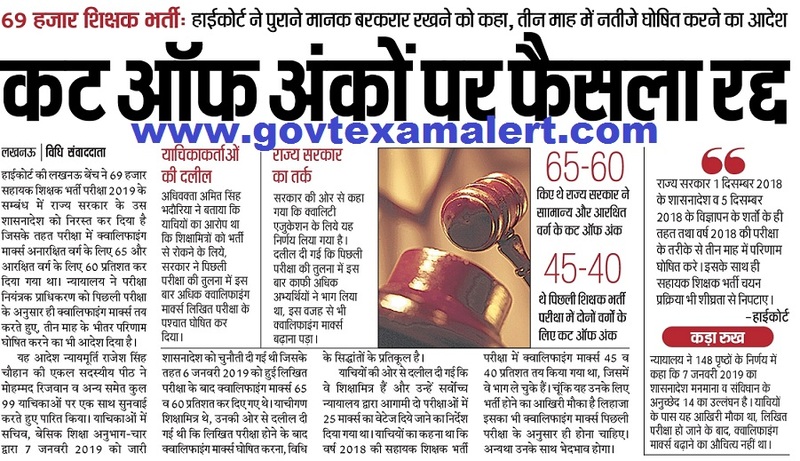 Court has stated that Weightage Marks will be added to those Candidates who pass in Written Exam. Read full news from Image below…. UP Basic Education Department has announced to make Recruitment on Assistant Primary Teacher Posts. Written Test was conducted for 69000 Assistant Teacher Posts. Written Exam was conducted by exam regulatory authority up. UP 69000 Teacher Bharti Written Exam was conducted on 06 January, 2019. 4.45 Lac Candidates has applied for Assistant Teacher Eligibility Exam 2019. 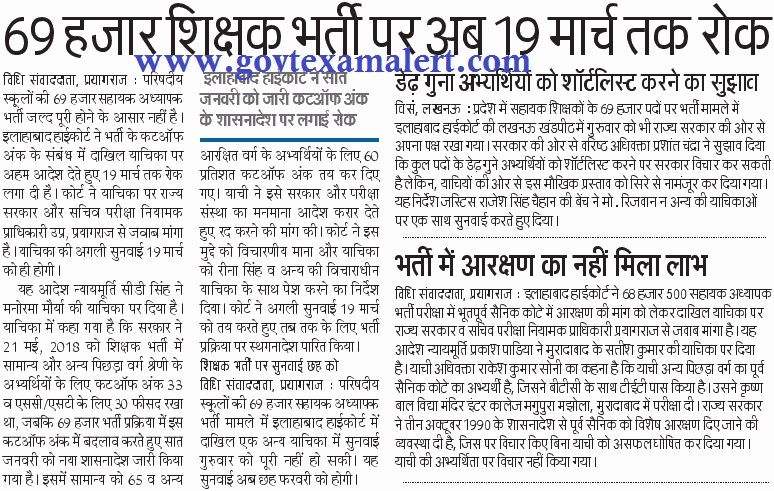 Details of UP Assistant Teacher Result 2019 is provided in this Article…. To Select Suitable Candidates for 69000 Assistant Teacher Posts, UP Exam regulatory authority has decided to conduct Teacher Eligibility Exam first. This Exam was conducted to shortlist candidates for Next Stage of 69000 Teacher recruitment 2019. Candidates who secure minimum qualifying Marks/ Cut Off marks in this Exam, will declare pass & called for next Stage. Exam regulatory authority has conducted this exam on 06 January, 2019 at 800 Centres all over the state. UP Assistant Teacher Written Exam Result 2019 will be available on official website (www.upbasiceduboard.gov.in/). Official UP Teacher Eligibility Exam Result 2019 will be available in the month of January, 2019. We will provide Latest Information regarding UP Teacher Written Exam Result 2019. Keep in touch with us for updates. Candidates who get minimum qualification marks will qualify this UP Assistant Teacher Eligibility Exam. It must be noted that this is only eligibility Exam, Selection will not provided based on this Exam. Eligible Candidates need to apply for UP 69000 Assistant Teacher recruitment 2019 in their Suitable Districts. Final Merit List will be prepared based on Written Exam Marks, Educational Qualification Marks. Candidates who will be high in Merit will be appointed as Assistant Teacher & will be provided joining letters. At First, Teaching Aspirants need to Visit Official Portal for Assistant Teacher Recruitment exam 2019 (http://atrexam.upsdc.gov.in/). On Home Page, Click on Link for UP 69000 Teacher Bharti Exam 2018-2019. On that Exam Portal, You will find link to Check UP Sahayak Adhyapak Bharti Result 2019. Candidates can check their Result by Entering their Details of Registration No. & Roll No. along with Date of Birth, Captcha. Candidates need to take print out of their Result for future reference. UP Teaching Aspirants need to have regular watch on Official UP Basic Education Department Website regarding New UP Assistant Teacher Result 2019. You can Bookmark this Page (CTRL+D) to get Latest Updates. 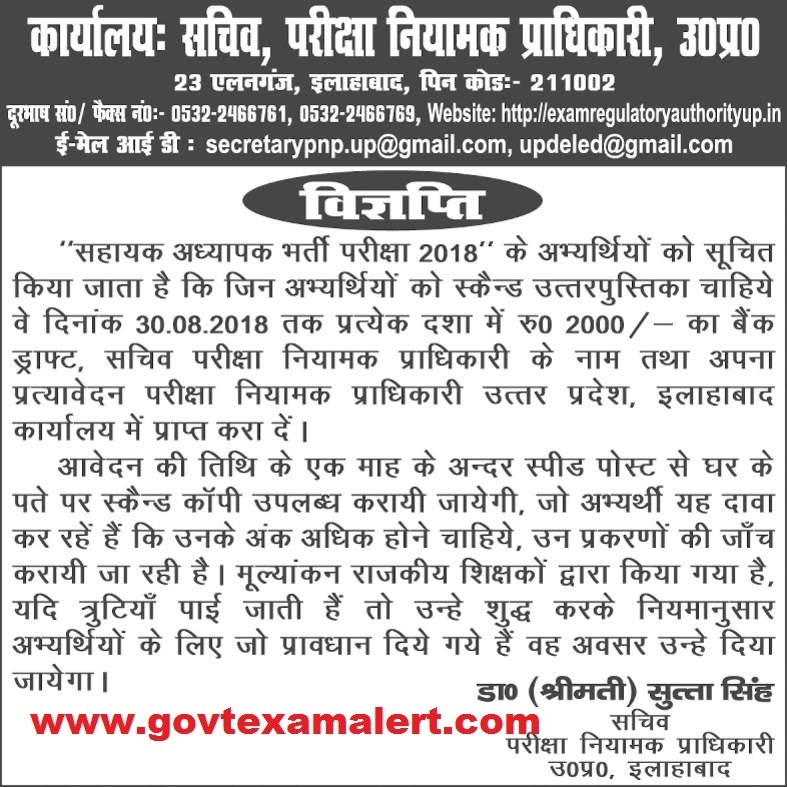 You can leave your query regarding UP Assistant Teacher Recruitment 2018 in the Comment Box. We will try to be responsive. Leave an email at Disha@govtexamalert.com for Assistance. District Allotment List of remaining 6127 Candidates has been uploaded Now. Counseling for these candidates will conduct on 3 & 4 September, 2018. 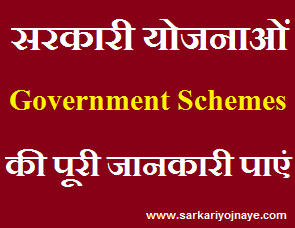 Download District Allottment List from link given below…..
Kisi ne joining form bhara???? Hi Seema, ab correction nahi ho sakte lekin aap mistake ke regarding affidavit laga sakti ho. Pls help me mere yet ki marksheet mein father name ki jagah mother name ho Gaya hai so please tell me about this problem. Hi Deepali, aap Up Exam regulatory authority se correction kara sakte ho.